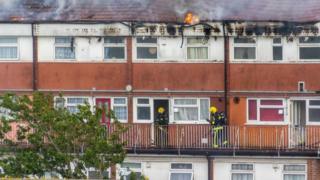 Fire chiefs say many short-term lets are "essentially operating as a bed and breakfast or hotel"
The growth of home-sharing rental properties is causing fire safety concerns, the National Fire Chiefs Council (NFCC) has told BBC Radio 5 live Investigates.Tourism industry leaders said a "Grenfell-style incident" could happen unless inspections were enforced.MPs have called for all properties used for short-term lets to be registered.The Short Term Accommodation Association said hosts are "strongly recommended" to follow safety guidance.An NFCC spokesperson said fire and rescue services are "not aware" of how many short-term rental properties are operating in local areas, making it "very difficult" to assess potential risk. They added: "Without this knowledge of properties essentially operating as a bed and breakfast or hotel, it is almost impossible to carry out an inspection or give owners relevant advice to ensure their buildings are safe." Fire safety law applies to all properties in which people are paying to stay. In 2017, a flat rented out on Airbnb in Plymouth was called a "deathtrap" after a fire inspection discovered it had toxic tiles, faulty locks and a fire extinguisher that had not been tested for more than 15 years. The owner was given a six-month suspended sentence. The property was taken off Airbnb, and has since been blocked from returning. Paul Bray, fire safety manager with Devon and Somerset Fire and Rescue Service, said the host showed a "lack of regard for life". "People aren't aware of their rights to be protected from fire - and they will stay in places where the minimum standards are not being met," he added. "We are concerned that there are a lot of properties like this out there. "Kate Nicholls, of the UK Hospitality and Tourism Alliance, said there was a large volume of evidence suggesting that commercial landlords were using online home-sharing sites to rent out large properties all year round. "We are potentially risking a Grenfell-type tragedy that would be disastrous for families and further damage our reputation as a safe, attractive tourist destination." Some short-term lets are advertised as "party houses"
There has been huge growth in the home-share rental market. Airbnb listings in 10 UK cities increased by almost 200% between 2015 and 2017 to more than 210,000 - which is more than 10 times the number of traditional bed and breakfasts.In March, MPs on the parliamentary group for tourism said "all businesses offering accommodation should compete on a level playing field" when it comes to regulation.But the B&B Association said there was currently a "total and utter lack of enforcement" of safety regulations in the short-term lettings market.Chairman David Weston said: "The authorities only inspect high-risk Airbnb style properties if someone complains, which is hugely unlikely, or if there is a fire. "Merilee Karr from the Short Term Accommodation Association said her members, which include Airbnb, have adopted the health and safety standards from the long-let industry. "We strongly recommend hosts to follow the guidance the industry offers all our hosts," she said. "Wherever we find instances where those standards aren't being met we address them with urgency." Fire risk is not the only issue that has been raised with online short-term rental properties.Andrea lives opposite a "They are paying rates for people to stay and be quiet - and these people are getting away with it. "Kateandtoms.com, the agent for the house, said they would address "all issues" with the owner. Liverpool City Council said the property was being investigated and a "planning contravention notice has been issued".Karen Buck MP, who has been campaigning for a short-term lets registration scheme, said there was now "growing consensus" around the issue. "We know there are a significant minority who are letting properties on home sharing sites that raise issues for neighbours and are in breach of the law - whether it's around insurance, fire safety, or anti-social behaviour. "They need to engage with us in order to prevent the problem getting worse. "An Airbnb spokesperson said the company had teamed up with the NFCC to provide hosts with information on how to make their homes safer, and run expert safety events. "If guests alert us to a hazard or safety issue at a listing, we immediately suspend the listing and investigate. "The overwhelming majority of hosts and guests are good neighbours and respectful travellers, incidents are incredibly rare. "5 live Investigates is on BBC Radio 5 live, 15 April at 11:00 BST - catch up on BBC iPlayer Radio.